Today we're going to talk about some of the benefits of our used, tested engines, when we can get them. Our ability to supply these are somewhat curtailed, but it's still a fantastic value! If you think about what it costs to get a Core for one of these 1275 A plus Engines, anymore, the value of these used, tested Engines are fantastic-because you could run it for years and then have a ready core. These days you've got to pay almost as much for a rebuildable core, as we're still able to supply these units for. We look for the 80's A plus units. It's really the whole package. They're going to have the Verto Clutch. Usually a pretty modern Ignition System. 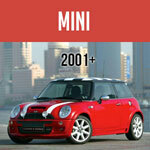 You can run them for years or you can upgrade your Mini in a snap to the bigger Engine and it's a complete . Then years down the road if you decide to rebuild it you've got one, because this is one of the biggest chunks of change you've got to come up with to do a 998 to a 1275 Upgrade, you actually have the physical 1275 Engine. Fire it up and see Oil Pressure right off the bat. See it settle down to a good number when it's idling. On average they'll light up at about 70 pounds and when you get them idling you'll see somewhere between 45 and 65 pounds-we would like to see that number as Oil Pressure. Another thing you look for is that it's a nice sounding Engine. There's no Rod Knock, there's no noises, there's no unusual clunking going on. Part of that is going to be good Compression. Usually if they run smooth, they have an idle, they're going to have good Compression. And we're going to look for even numbers, should be somewhere between 150 to 200 pounds. We have determined good Oil pressure, good Compression, sounds good, will idle down to a speed where it still has good Oil Pressure. We literally will do a compression check after the fact and look at those numbers. One of the good indicators of the Engine's health is if there is a lot of Blow-by, does it smoke? We'll run them through the Gears. You can use a pair of Pliers or a Channel Lock on the Stub Shaft, without messing with the clutch, because there's no Axles. So your Synchros just turn the outputs enough to engage the Gears cleanly. So I got it in all for 4 forward Gears and reverse. With no Axles hooked up, everything that we can do to test this unit has been done and so far we like the look of it, we the think this is a good runner. The only thing we can't check on the stand is going to be the Clutch actuation. Obviously we can't put a load on this. We can't load the axles, we can't simulate the weight of the car but we've had great success over the years. Trust Mini Mania To Provide You With The Best. 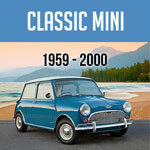 Our Classic Mini Pre-Owned Engines are going to provide you with a good service life and then when you're ready to rebuild it, there's a core. We have probably tested hundred of these over the last 15 years, and can't recall but maybe 1 or 2 that had any issues that were detrimental to the value that somebody had and so it's a great way to go. Now Open! Mini Mania Engine Shop. Trust the experts.